Mrs. Quarmby, widow of the late Rev. John Quarmby, entered into rest early on Monday morning, November 12, 1900, aged 57 years. Her parents, who were of Welsh descent, came to reside at March Lane, in Nantwich circuit, many years ago. They at once joined the Primitive Methodist Church in this place, our late sister attending the services regularly. At an early age she was converted to God, and became a useful member of our society there. She was married to the Rev. 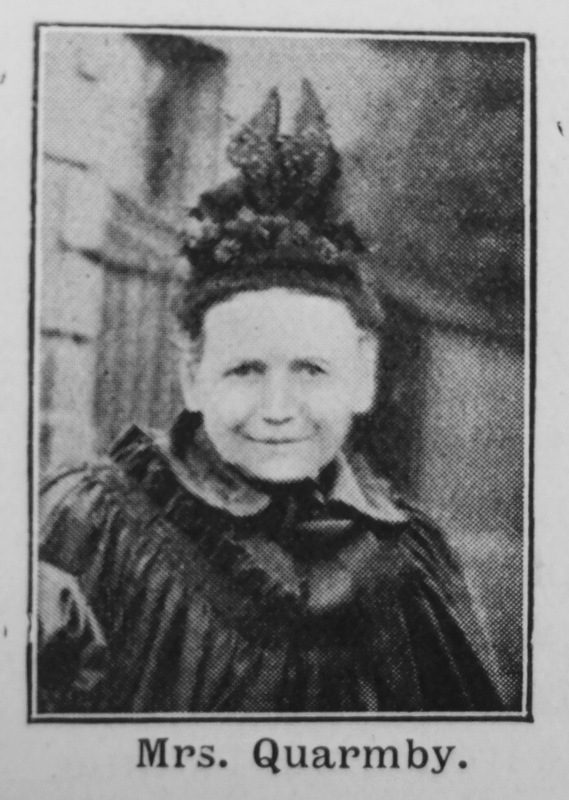 J. Quarmby in the year 1864, to whom she was a helpmeet indeed. The excellence of her life and character may be seen from the fact that she succeeded in leading all her surviving children to Christ, and to join the church to which she belonged, the two elder sons being local preachers. Her kindness of heart and practical sympathy won for her many friends in the different circuits where they laboured. Emily was born at Perthfaen, Shropshire. She was baptised on 2 July 1843 at Llanymynech, Shropshire. Her parents were John and Sarah. In 1851 John was an agent for a stone quarry. Emily married John Quarmby (1834-1895) in late 864 at Nantwich, Cheshire. John’s obituary recorded that they had ten children, five of whom survived him.